Crazy props = crazy fun! When you engage Portland Photo Party you get, at no extra charge, a huge selection of props. 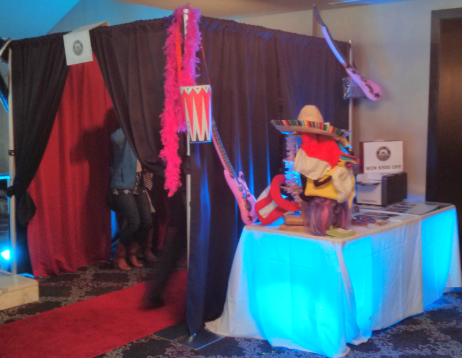 The props table displays hundreds of fantasy glasses, wigs, helmets, masks, hats, inflatable toys and other props that allow your guests to get creative, crazy and have fun. More space = more fun! 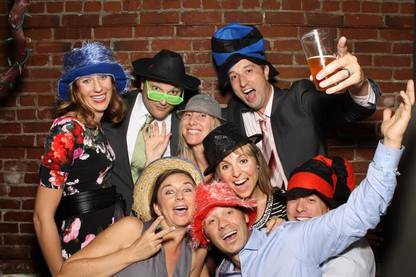 Unlike traditional photo booths, Portland Photo Party's booth can expand to 7 feet by 7 feet, accommodating a huge crowd to share in the fun -- up to 15 people. We also offer an open-air photo lounge format for even larger crowds. The more the merrier, without a doubt! Portland Photo Party's photo booths can be draped in a host of custom colors and decorated with uplighting to match your wedding or celebration theme. Your guests will also appreciate the luxurious options: Red carpet, brass stanchions and red velvet rope deliver a strong message to your guests: this is a classy affair! We print an extra copy and paste it into your wedding scrapbook, which your guests then sign. You also get a flash drive containing high-resolution originals of every photo and video taken by your guests. We'll work with you to design a custom logo or photo template for your special event.